Ever ignore an entire portion of the menu? Just politely pretend it isn’t there like that PETA volunteer grinning on the sidewalk asking if you have a second to save the wombats? 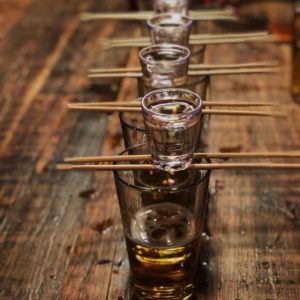 You’ve seen sake on the drink list ever since your first trip to the sushi bar. You know it’s Japanese, maybe served hot, and something about tiny cups? You tried it once and didn’t hate it, but all the foreign names can get confusing, and it’s probably easier to stick with Sapporo. But if you’ve been out recently, you might have noticed sake creeping onto menus in restaurants where you can’t order dinner by the boat. From izakayas to cocktail bars, sake has become more than just a foreign novelty, with drinks professionals no longer willing to sweep a category as broad and beautiful as sake under the rug. So it’s time to start returning sake’s calls. 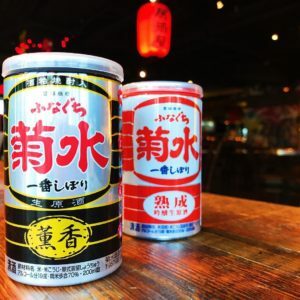 Read on for the skinny on this delightfully complex beverage, and get ready to say kanpai! Sake is commonly referred to as Japanese rice wine. Technically it’s closer to beer than wine, fermentation-wise, but technically everyone’s supposed to say “whom” sometimes, and nobody wants to be that guy. Sake is very much Japanese and is always made from rice, but while the end product shares winey qualities like variety, complexity and aroma, a distinct lack of acid means it tastes almost nothing like actual wine. Sake is actually just the Japanese word for “alcohol,” while the fermented rice-based beverage that’s up for discussion here is called nihonshu (don’t worry: you can forget that now). It takes just four ingredients to make: rice, water, yeast, and Koji (mold—the good kind). The rice gets milled, or “polished,” to expose the starchy goodness underneath, and the amount of polishing is an easy way to pin down a sake’s quality. For reference, to go from brown rice to white, about ten percent of the grain is removed; some super premium sakes require more than half of each rice grain to be polished away before fermentation. The milled rice is steamed, then some is set aside and mixed with Koji spores. Once the mold has converted enough starch to sugar, water and yeast are added and the mixture is left to brew for a few days. Some Tōjis (sake brewers) will add distilled alcohol to the mash to extract more flavor from the rice before the solids are filtered out, and after the liquid matures it’s usually diluted to lower the ABV to something close to wine. Within those simple ingredients lie nearly endless permutations—over 70 varieties of rice can be used to make sake. But the four main styles you should concern yourself with are Junmai, Honjozo, Ginjo and Daiginjo. Junmai, meaning “pure rice,” is a full-bodied sake made with no additives. It’s a decent indication of quality, but a skilled brewer can add distilled alcohol to make some truly special stuff, so don’t turn up your nose just because you don’t see Junmai on the label. Honjozo sakes are polished to a minimum of 70% with a small amount of added alcohol. The extra hooch makes them smooth, easy-drinking and lightly aromatic. They’re great for pairing with food. Ginjo is a premium sake polished to at least 60%, known for being fun and fruity. Daiginjo is the top of the ladder, the delicate, fragrant, super-premium stuff polished to 50% that usually tastes better when someone else is buying. One of sake’s unique qualities in the world of alcohol is its tea-like ability to be enjoyed at a range of temperatures. Warming it up accentuates the alcohol and suppresses the aroma, so if you’re looking for a toddy, try a Junmai or Honjozo rather than something with a delicate bouquet (both can also be delightful at room temp). Like revenge, premium Ginjos and Daiginjos are best served cold, but none of these rules are particularly strict. Drink ’em how you like ’em. Now that you know where to start, there’s an abundance of sake available all over the city. If you’re looking to try some with your sushi, Hojoko and Whaling in Oklahoma have great and extensive menus (and those cute little single-serving sakes in the collectible cups). For your at-hope tasting needs, Urban Grape has a great selection and the know-how to help you find what you didn’t know you were looking for.